Preprocessing GUI for SOM Toolbox is a tool for manipulating 'som_data' -structs. 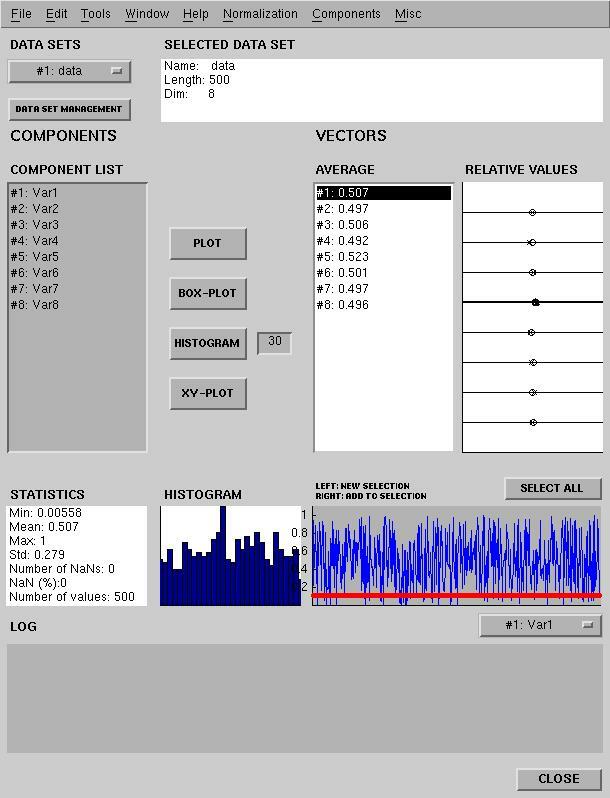 GUI contains several preprocessing tools for data set. In the upper left corner under the text 'DATA SETS' is popup -menu that selects the current data set. 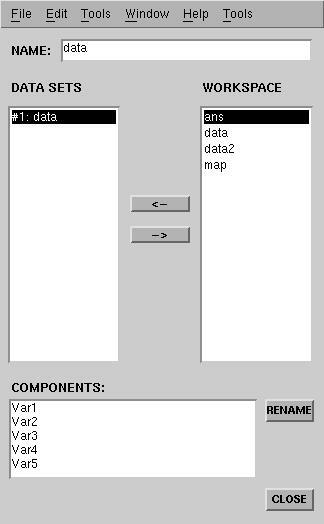 Loading, saving and renaming is performed by opening a 'DATA SET MANAGEMENT' -gui using the button under this popup -menu. 'SELECTED DATA SET' -field contains information of the current data set. Field 'COMPONENT LIST' contains the names of the components. Components for preprocessing can be chosen from this field by using the mouse. A discrete selection can be made by pressing <CTRL> -key during the selection. Pushbuttons beside the 'COMPONENT LIST' -field visualize the chosen components. PLOT visualizes data points one after another. BOX-PLOT uses Statistical Toolbox's boxplot -function (type 'help boxplot' in workspace). HISTOGRAM plots histograms by using n bins (default n is 30, value can be changed by writing the new one to the text box beside the HISTOGRAM -button. XY-PLOT plots the first two chosen components, the second as the function of the first one. On the right of the buttons is the field 'AVERAGE' which shows means of the selected vectors. The 'Relative Values' -axis shows relative statitistics of every components chosen vectors. The left limit if the axes is every components minimum and the right side maximum. Tha black lines shows interval containing values of the chosen vectors. The circles in the axis are the means of the chosen vectors and x -marks show show medians. STATISTICS -field contains statistics of the current component, and in the HISTOGRAM -axis is the histogram of the current component. The current component is drawn in the axis, which is on the left side of the histogram. This axis also shows the selected vectors as red circles. The vector selections can be made by selecting regions from the axis. The SELECT ALL -button selects all vectors. The current component can be chosen from the popup -menu under the axis. It should be noticed that this selection has nothing to do with the preprocessing operations. It only selects the component to be shown in the three fields above the popup -menu. The 'LOG' -field shows the results of the operation and the CLOSE -button closes the application. Renaming data set is simple. The new name has to be written to the position where the current name is. This is also the case, when components are renamed. The RENAME -button beside the 'COMPONENTS' -field completes renaming components. Data sets can be loaded from and saved to the workspace by using the arrow buttons. The variables in the workspace are shown under the 'WORKSPACE' -text and the data sets in the memory of the preprocess -tool are shown under the text 'DATA SETS'. The darkened data set is copied or saved. 'Copy' copies a darkened data set. 'Delete' deletes a darkened data set. 'Refresh' refreshes the workspace variable set. Scale [0,1] normalizes the normalizes the chosen components between the interval [0,1]. Scale Var=1 scales normalizes the components chosen so that their means will become 0 and variance 1. Eval (1 comp) evaluates the expression given by user. The Reserved word for the expression is x (the first chosen component). Move component moves the first chosen component to the position wanted. Copy Component copies the first chosen component to the position wanted. Add: N binary types creates N new binary components (N is the number of different values in the chosen component.) Value in the new component in the kth position is 1, if the value indicating the new component is the same as the kth value in the chosen component, other values are zeros. Add: zeros creates a new component containing zeros. Remove component removes one component. Remove selected vectors removes the vectors that can be seen as red circles in the axis under the SELECT ALL -button. It is possible to save the values removed to the workspace. Select all components sets all the components selected. The 'Misc' -menu contains submenus and miscellanous operations. Get LOG-file saves all the operations done as an m-file. Indices of the selected vectors saves indices as an vector to the workspace. Undo cancels only the previous operation. Number of values calculates the number of different values of the components chosen and prints them to the LOG -field. Number of selected vectors calculates the number of selected vectors and prints it to the LOG -field. Correlation calculates the correlation of the first two selected vectors and prints it to the LOG -field. Unit length scales vectors of the chosen components to the unit length. Clipping opens a gui for data filtering. 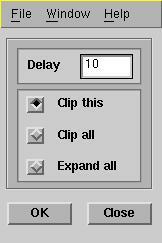 Delay opens a gui for setting delays to data. Windowed opens a gui for Windowed -operation. 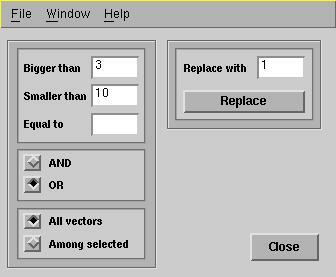 Select Vectors opens a gui for selecting vectors. Clipping selects values of the chosen component by upper (Smaller than -field) and lower (Bigger than -field) limits and values that are equal to some value (Equal to -field). Values are combined by union- (OR -option) or intersect- (AND -option) operation and then replaced by the value given by user (Replace with -field). The filtering is performed by pushing Replace -button. If Among selected -option is used, the selection is made among the selected vectors, otherwise it is made among all vectors (All vectors -option). Close button closes this gui. The Delay -field sets the length of the delay. If the Clip this -option is chosen, the number of the vectors of the data set stays the same. The values that don't match to any of the old vectors are clipped away from the component to be delayed. NaNs will be added to the empty places. If Clip all option is used, points where otherwise would be NaNs when used the former way, will be clipped away from all the components. Also, the number of vectors wii decrease. Expand all -option does not clip anything away from the component to be delayed. The number of vectors will increase and the new vectors will have NaNs everywhere else, but in the delayed component. 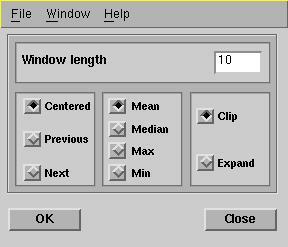 The length of operating window is set to the field Window length. The field containing options Centered, Previous or Next indicates whether the operational point of the window is in the middle (Centered), in the beginning (Next) or in the end (Previous).The four options in the middle of the gui (Mean, Median,Max,Min) indicates which operation is evaluated in the window. The rightmost options, whether the number of vectors of the data set increases (Expand) or stays the same (Clip). The window is moved over the current component and the operation is evaluated in every point. The result of the operation is set to the operational point of the window. Figure 5. Select Vectors The Select Vectors -gui selects vectors in the same way as does the Clipping -gui. The difference is that it does only the selection part and does not replace values. Select Vectors selects values of the chosen component by upper (Smaller than -field) and lower (Bigger than -field) limits and values that are equal to some value (Equal to -field). Values are combined by union (OR -option) or intersect (AND -option) - operation. If Among selected -option is used, the selection is made among the selected vectors, otherwise it is made among all vectors (All vectors -option). Vector indices that are given to the field Vectors are added to the selection. OK -button evaluates selection and Close -button closes this gui.